Broadcast Message allows Homepass users to bulk send SMS messages to contacts on their Homepass Visitor Lists. Your device must run Homepass version 3.1.0 or later (both iOS and Android - available from the App Store and Play Store) and have a SIM, phone number and the ability to send SMS text messages. This feature is only available to paid subscribers on Homepass Standard. SMS and iMessages are sent directly from your phone and will be charged by your phone service provider as a Standard SMS. 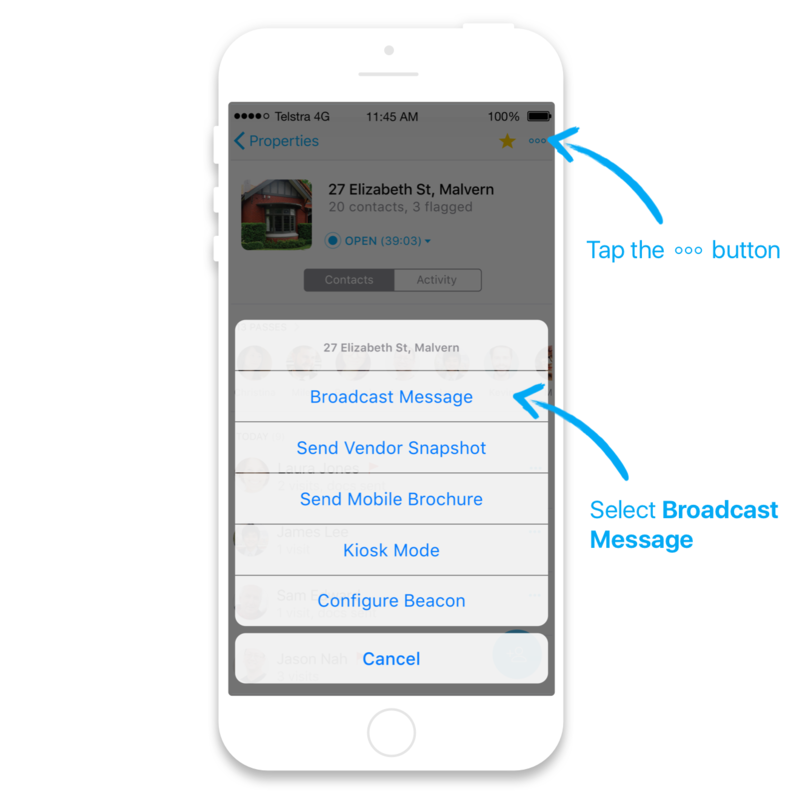 Step 1 – Select a property in your Homepass app and tap the 3-dot button on any property, and select "Broadcast Message". 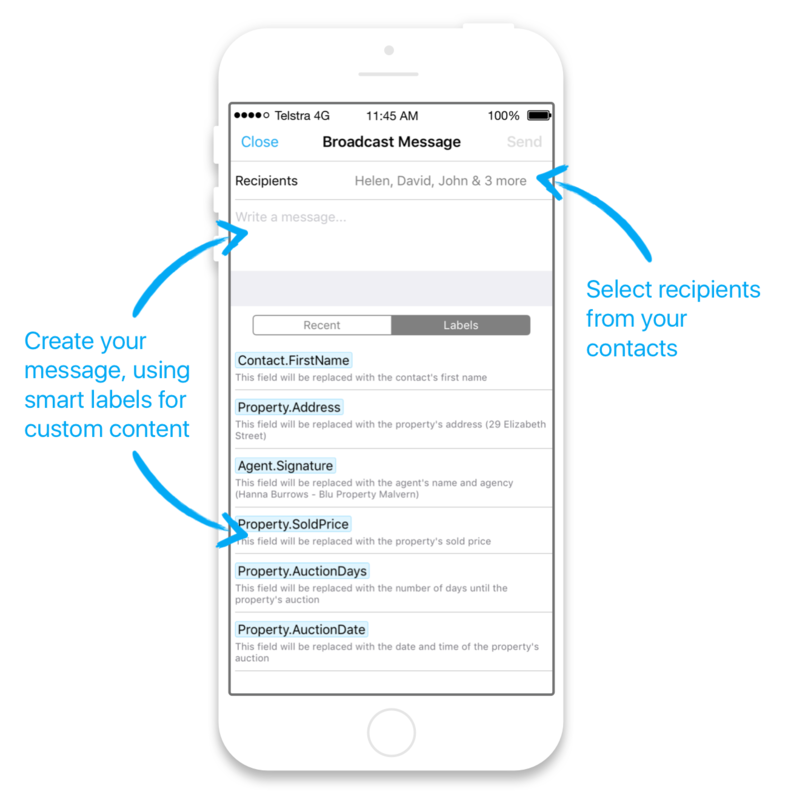 Step 2 – select your recipients, write your message (or pick one from the list) and hit "Send". How do I edit my Broadcast Messages? All suggested messages listed under 'Recent' can be edited. Simply tap the 'Recent' message to insert it into the Text field then tap the text again to add or edit the words same way you would change a text message before sending it. You do not have to use the labels if you do not wish to. One of my visitors responded to a Broadcast Message but the Sender has come up as a phone number - how do I find out who replied? You can search your Homepass Contacts from the Contacts page in the app by entering the mobile number in +61 format without spaces (e.g. +61xxxxxxxxx) to quickly locate their name and Contact profile. If you have this person saved in the Phone Book on your phone, the name they are saved under will appear as the Sender. Please let us know if you need any assistance or have any feedback. We're always happy to help!